This bursting arrangement is creatively prepared using very popular flowers, the pleasant fragrance from the Oriental Lily, bountiful mixed Eustomas and seasonal local flowers all combine to make this an incredible stunning day brightener for your special someone.Lilies may be sent closed/partially closed in order to prevent damage and to last longer.Featured vase not included. We recommend sending a superior vase to add sparkle to Serenity. This perfect combination is sure to leave a lasting impression. On point fast delivery, very good experience. Excellent service and my daughter said the flowers were beautiful. 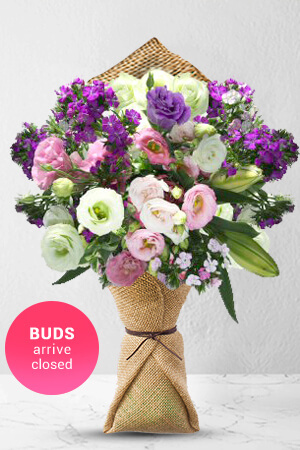 This is my 1st time to use zFlowers, it is easy to order and you delivered the flower on time with good quality. Thanks!